A Special Inspector General for Afghanistan Reconstruction report reveals the major recipients of DoD's Afghanistan reconstruction programs. Accountability for the massacre in Iraq is a start—but we should also be talking about reducing reliance on private military contractors. 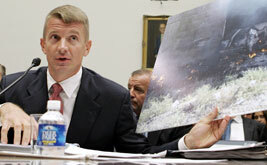 Why is Blackwater founder Erik Prince building a mercenary army for the United Arab Emirates? The contracted guns will be much less involved in maintaining the peace than they will in suppressing any dissent within the country. 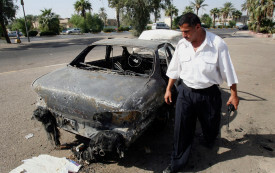 Blackwater's infamous founder is building a mercenary army in the United Arab Emirates. Christina-Taylor Green was nine years old. She was born on September 11, 2001. She died on January 8, 2011 in Tucson, along with a federal judge and four others in a shooting targeting her Congresswoman.